By now, most companies realize they need to be implementing a content marketing strategy. As they start to exercise this new marketing muscle, their efforts can quickly veer off track, if they’re not careful. 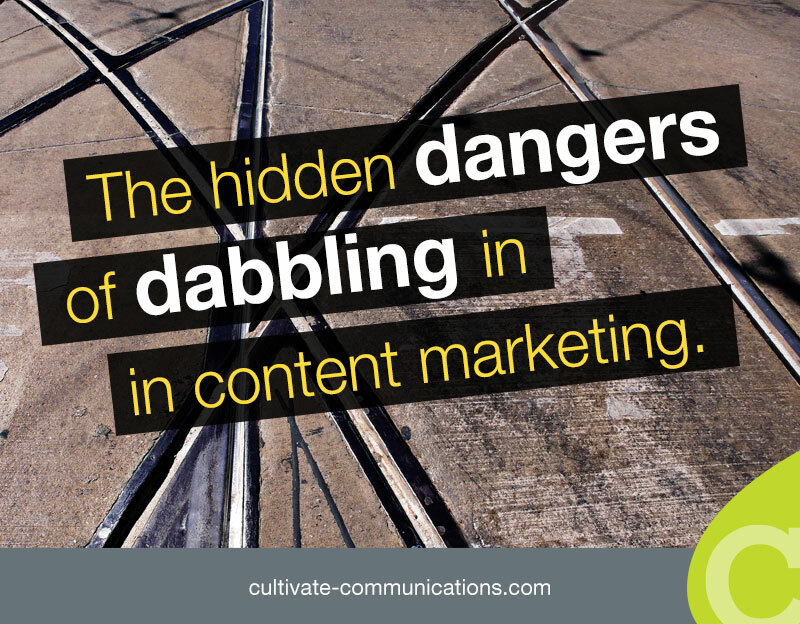 In other words, those companies that dabble in content marketing tend to fail. Without a strategy, early efforts at content marketing tend to be scattered, disconnected and ineffective. Producing content without a specific target audience and well-developed personas is like sailing a ship without a rudder. Without the ability to steer, it gets pushed in any direction the wind blows. So it is with corporate content experiments. Without a consistent direction and publishing calendar, they deliver little or no measurable results, and thus quietly wither away. Even though pilot programs tend feel more structured than ad hoc experiments, they often end up in the same place. You not only need quality, customer-focused content, but also consistency to win at this new game. A several-month experiment doesn’t usually produce enough engagement data for the marketing team to extract meaningful insights. Building customer relationships takes time – far longer than the typical timeframe of a pilot project. Only one-third (30%) believe they are effective at it. When it comes to content marketing, failing to plan is planning to fail. A clear set of objectives. What are your goals for launching a content marketing initiative? To increase brand preference? Generate a larger number of qualified sales leads? Be clear on your destination. Define it as specifically as you can in your plan. A tightly-defined target audience. Who are you trying to influence as part of this content marketing initiative? Focus on a single, narrowly-defined audience segment whose need to conserve. A comprehensive audience persona. Invest time developing a detailed audience persona. What problems does this person face in their business? What keeps them awake at night? What motivates them? What are their aspirations? Describe their buyer’s journey. What are your touchpoints with this person from the time he or she first joins your list until they purchase your product or service? Add this information to a timeline. Define their needs at each touch point on the customer journey. These needs will change significantly throughout this process. Map this information to your timeline. Brainstorm content ideas for each stage of the buyer’s journey. Develop ideas for high quality informational content that will help to nurture them each step of the way. After you launch your content marketing initiative, review the data from your metrics to determine which content is resonating with your audience and which pieces are not. Make adjustments as needed. Do you have a documented content strategy, customer personas defined and content mapped to it? If not, now's the time to develop a comprehensive plan to take your content initiative to new levels of effectiveness.